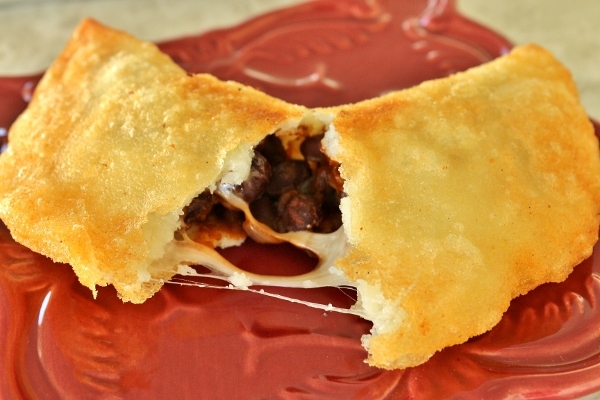 Another great party idea for an upcoming Olympics party would be empanadas. There are so many different varieties from many distinctive countries. 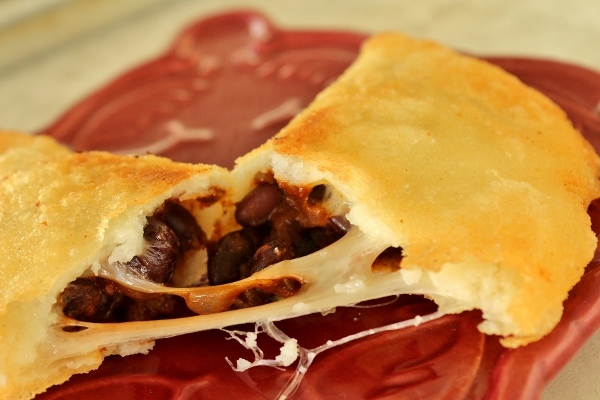 A really fantastic cookbook entitled Empanadas: The Hand-Held Pies of Latin America features a whole slew of them from a specific region of the world. 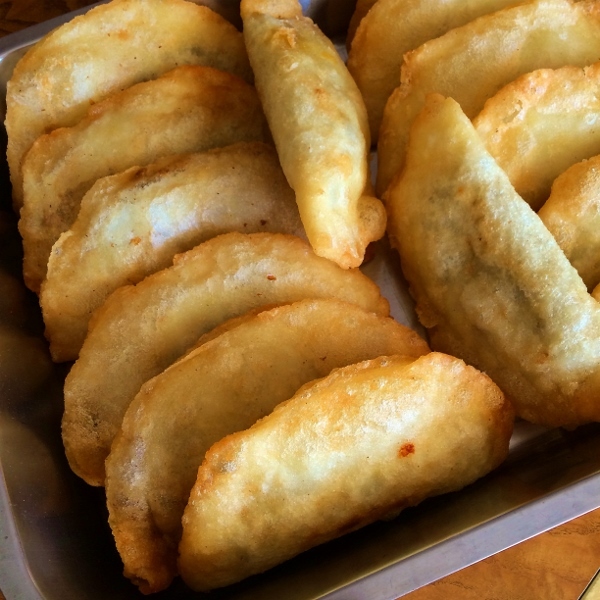 I have previously made Golden Chicken, Potato, and Green Pea Pies (Salteñas de Pollo) from Bolivia, which are wrapped in a sweet, golden dough and baked, but most recently decided to try a classic Venezuelan empanada which carries the name "domino" because of its black and white filling. These empanadas are vegetarian (minus the inclusion of Worcestershire sauce, which contains anchovy), and super crispy and delicious. 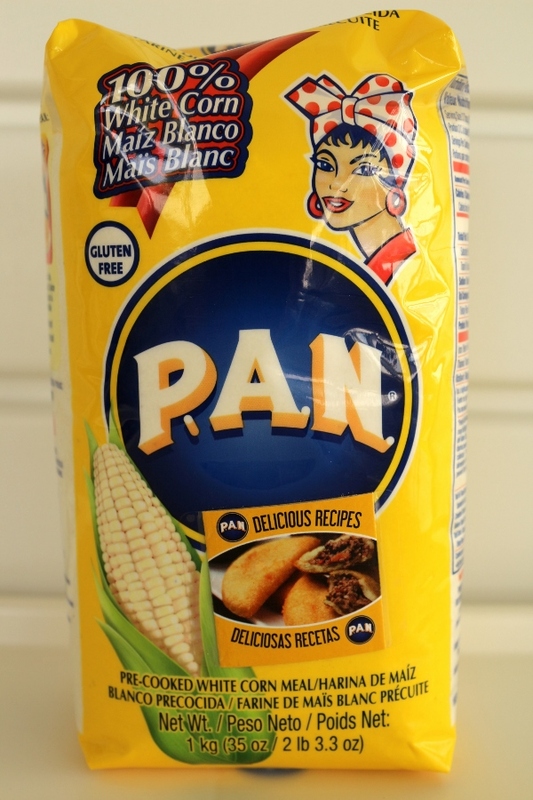 The dough is made with precooked cornmeal, also known as masarepa or harina pan. Yellow masarepa is preferable because it yields a much more golden-hued dough, however I was only able to procure the white variety, and mine still turned out pretty fantastic. 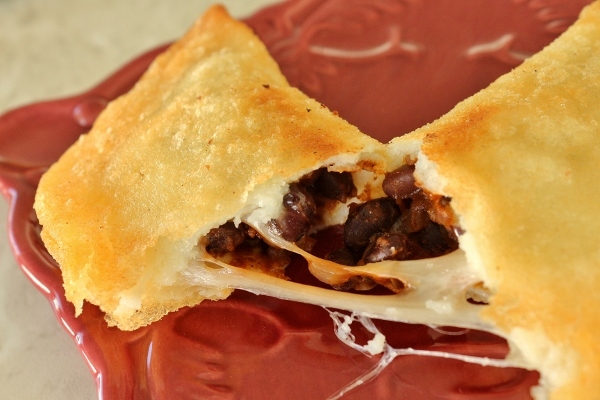 Between the protein-packed black beans, and the gooey cheese, these empanadas are surprisingly filling. Add the fact that they are wrapped in corn and deep-fried, you'll only want to consume a couple of these at most in a single sitting. I was able to prepare these slightly ahead of time for a recent game night gathering, and then reheat them in the oven on a baking sheet. They were still crispy and delicious even after reheating them. The key is to let them drain on a cooling rack set over a baking sheet, so they don't get soggy. This is truly ideal for any fried food, and I would never go back to soggy paper towels. I hope this post has inspired you to step outside of the box at your next party (whether it's an international-themed Olympic celebration, or any other excuse to hang out with friends or family), and try something new. This will impress meat-eaters and vegetarians alike with it's luscious black-and-white filling. Make the Filling: In a large skillet, heat the olive oil over medium-high heat. Add the onions, leeks, aji or serrano pepper, garlic, annatto, and cumin. Cook until the onions have softened, 4 to 6 minutes. Add the tomato paste and Worcestershire sauce; stir well and cook for 30 seconds. Add 1 cup (240 ml) water, the beans, salt, and black pepper; bring them to a boil, lower the heat to medium, and simmer for 10 minutes or until they have thickened, stirring regularly. 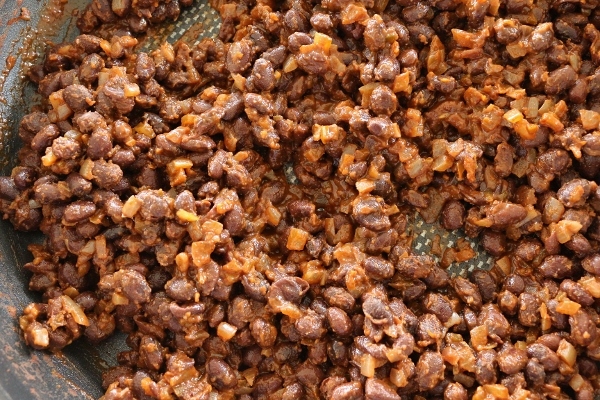 Remove the filling from the heat and let cool; cover and chill thoroughly (at least 1 hour or overnight). Make the Dough: In a large bowl, whisk together the cornmeal and salt. Add the water slowly, in a thin stream, kneading the mixture with your hand until it comes together into a ball with the consistency of mashed potatoes (if the dough is too dry, add a few more tablespoons of water at a time; if it's too wet, add a few tablespoons of the precooked cornmeal at a time). Turn the dough onto a clean surface and knead it until smooth, 45 seconds to 1 minute or to the consistency of play dough. Return the dough to the bowl, cover it with plastic wrap or a damp kitchen towel, and let it rest for 10 minutes (to allow the fine grains to absorb all of the liquid). Assemble the Empanadas: Line a large baking sheet with parchment paper; set it aside. Divide the dough into 18 equal pieces (about 2 ounces/55 g each). Line a tortilla press with a zip-top freezer bag that has been cut open on three sides so that it opens like a book. Place a ball of dough in the middle of the tortilla press and flatten it into a 5-inch (12-cm) round, about 1/8 inch (3 mm) thick. If you don't have a tortilla press, flatten each ball using a flat-bottomed, heavy skillet. 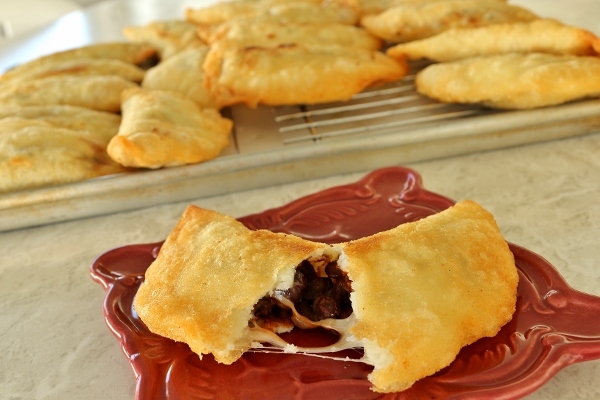 Place 2 tablespoons of the filling and 1 tablespoon of the cheese in the middle of the round, leaving a small rim. Use the bag to fold the dough over the filling, forming a half-moon. Press the edges together with your fingers to seal. Transfer the empanada to the prepared baking sheet. 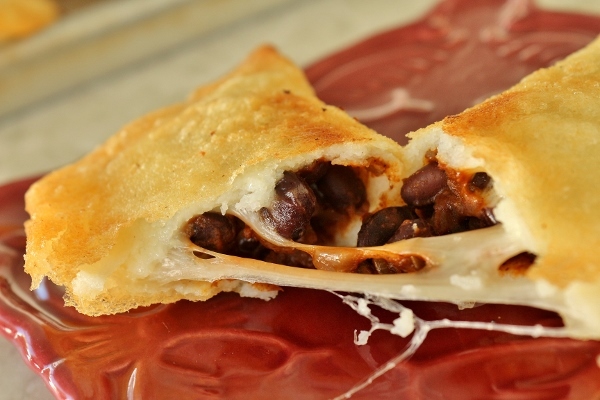 Repeat with the rest of the dough and filling, keeping the empanadas covered as you go. 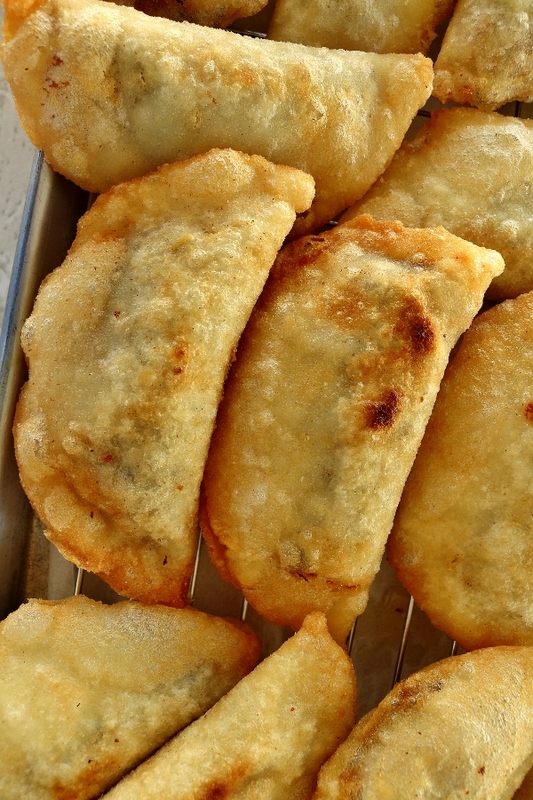 These empanadas can be shaped and filled up to 1 hour before frying as long as you keep them covered and chilled until you're ready to fry. 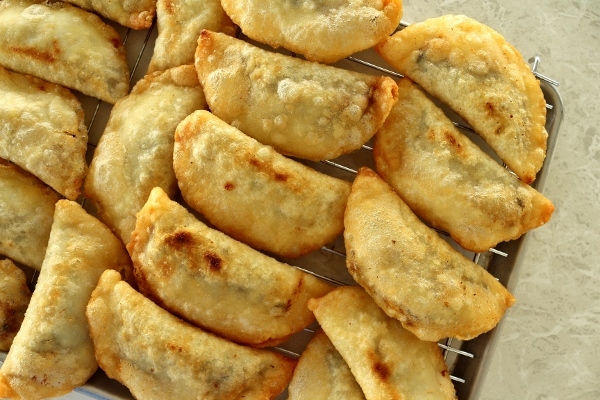 Fry the Empanadas and Serve: Fit a large baking sheet with a metal cooling rack and set it aside. In a large skillet with high sides, heat 1 to 1 1/2 inches (2.5 to 4 cm) of vegetable oil to 360 degrees F. You may also use a deep-fryer according to manufacturer's directions. Working in batches of 4 or 5 empanadas at a time, carefully slide them into the oil (I fried 3 at a time so my Dutch oven wasn't too crowded). Fry them until golden, 3 to 4 minutes, turning them over halfway through. If the oil gets too hot as you fry and they're browning too quickly, lower the temperature and let the oil cool slightly before frying any more. Use a slotted spoon to transfer the fried empanadas to the prepared rack to drain (I use a spider skimmer). Serve them immediately, or keep them warm in a 250 degree F oven for up to 1 hour before serving. Note: Once fried, these empanadas can be frozen for up to 3 months. Freeze them in a single layer on baking sheets lined with parchment paper; once frozen solid, they can be transferred to freezer boxes or zip-top bags. Reheat them at 350 degrees F for 12 to 15 minutes, or until their centers are hot.